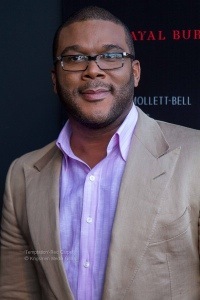 Tyler Perry has stepped in to make sure that an Atlanta family facing eviction keeps a roof over their heads. Nieves admitted that she has trouble paying rent and hasn’t been paying on time, but that the apartment complex has always worked with her. Nieves’ and her 16 year old son were returning from a Make-a-Wish foundation funded trip to meet basketball star Derrick Rose when she was struck with the news. She tried to pay for March and April’s rent but was denied, “I was told that corporate office told her not to accept any more rent money from us,” said Nieves. Nieves says that she receives no child support for her four children and lost her job two years ago. Being evicted would mean heading to a shelter, which could put her son who has already had two bone marrow transplants in danger. Perry just happened to be watching Atlanta’s Channel 2 Action News when he came across Nieves story; he reached out and offered to pay one years rent. He says that he has tried contacting the apartment’s management, but has not been able to reach anyone. Although the eviction is scheduled for Tuesday it is not clear whether it will happen or not. Nieves became emotional, showing her gratitude for the gesture, “Thank you. Thank you for watching the news when you did,” she said.